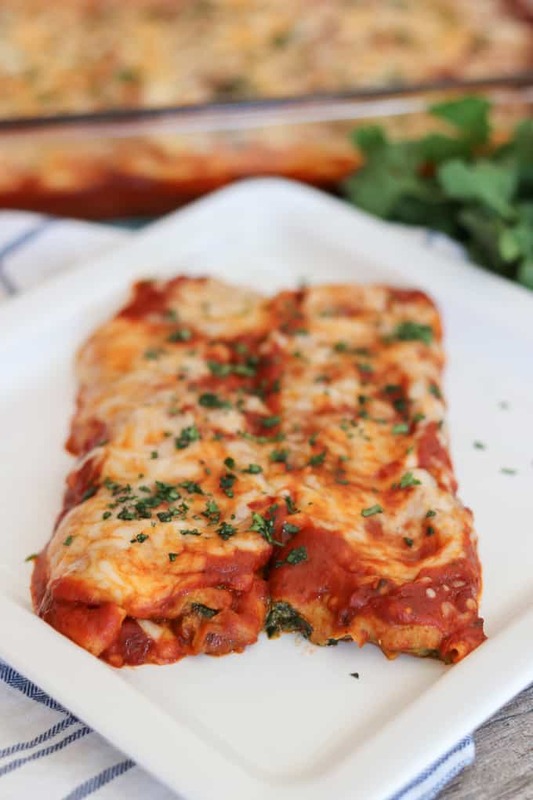 This Spinach and Cheese Manicotti is an old family favorite. It starts with a smooth, creamy filling made of cottage cheese and spinach, and is rolled into a homemade crepe. Serve them with a salad and you have a delicious dinner that your family will enjoy for years to come. This is an old and treasured family recipe. I am proud to be partnering with Shamrock Farms to bring you this post. As always, all opinions are 100% my own and I thank you for supporting the brands I believe in. I can’t believe that after 27 years of marriage I haven’t made these before this! Hello? And why the heck not? Honestly, I’d forgotten about them after my mother passed in 1992 until I came across her recipe card the other day. It was kind of bittersweet. Mom used ricotta in her recipe, but I went with Shamrock Farms Lowfat Cottage Cheese. I think it’s the perfect substitute. With 13 grams of protein per serving, it’s lower in calories and fat which is important when feeding my family. I also love that cottage cheese can be used in a variety of recipes, both savory and sweet. It’s also great in lasagna and is what I always use in my blintz recipe. Those are incredibly tasty and a special family treat! I’ve been using Shamrock Farms cottage cheese for years. Every one of their products starts with pure, wholesome, nutritious milk with no added growth hormones. That’s so important! They’re also a real working dairy farm right here in Arizona and provide tours so that we’re able to experience the hands-on approach they’ve refined for three generations. I grew up with mom making crepes for her manicotti, and when she did she’d make an extra batch just so I could enjoy them plain with some maple syrup – my favorite way to eat them. In Italian, they’re also known as crespelle. If you’d like, you can use the pasta manicotti shells available at your local grocery store. I prefer the crepes as they’re lighter and the perfect vessel for the smooth, cheesy filling. Please don’t be intimidated by the thought of making them. They really are easy, it will just take a bit of practice and the better you get the faster you’ll go! Use a blender to mix both the crepe ingredients and the ingredients for the filling. It’s so much easier. The crepe batter needs to rest for a half hour after mixing and can be poured directly into the pan or into a 1/4 measuring cup. Make sure the spinach is completely thawed and then squeeze out as much moisture as possible. If you do not, the manicotti will be too soggy. Feel free to use the pasta manicotti shells that are found at your local grocery store and use the filling recipe below. They’ll work just as well as the crepes. To save on your prep time, the crepes can be made up to three days ahead! Put them in between layers of wax paper and place them flat into a gallon-sized sealed plastic bag. Store in the refrigerator or freeze up to two months. Thinking about what might be good to eat with these Spinach and Cheese Manicotti? I’ll serve them with my Grandma’s Italian Bread and a salad. This easy side salad is a great recipe when you’re pressed for time. You can also add a few sliced carrots and cucumber to it if you’d like. A Super Simple Spinach Salad is a great option, too. Color it up with some sliced red and yellow pepper, a carrot, and tomato. For dessert, serve my Easy Lemon Cake or this No-Bake Chocolate Eclair Cake. They’ll sure satisfy your sweet tooth craving after dinner. 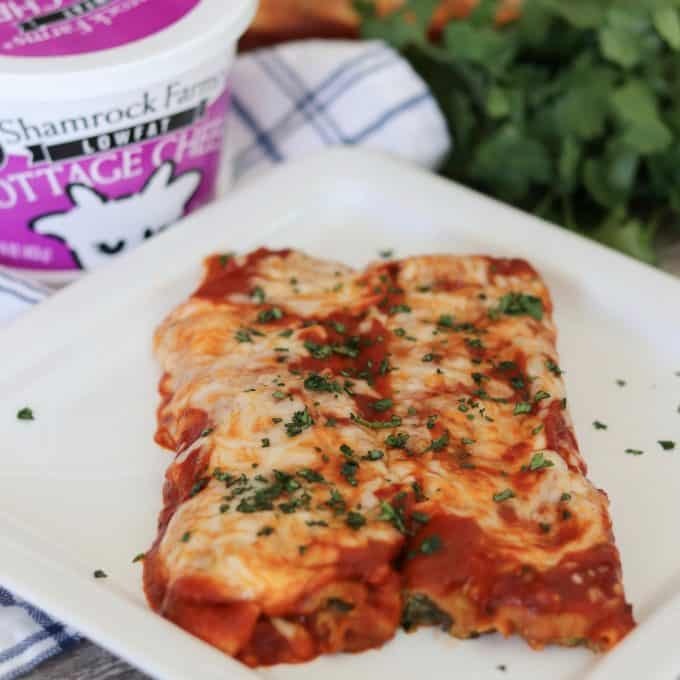 Shamrock Farms is having a Roxie’s Cottage Cheese Recipe Challenge from March 2, 2018 to March 16, 2018. We’d love for you to vote for your favorite blogger recipe! When you do, you’ll be entered to win your very own Roxie Prize Pack valued at $250. So check it out! 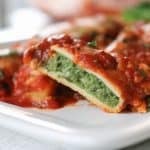 This easy Spinach and Cheese Manicotti is an old family favorite. It starts with a smooth, creamy filling made of cottage cheese, spinach, and eggs, and is rolled into a homemade crepe. Serve them with a salad and you have a delicious dinner that your family will enjoy for years to come. Place all crepe ingredients into a blender and mix until smooth and well combined, scraping sides of the blender as necessary. Cover and let batter rest for a minimum of 30 minutes. 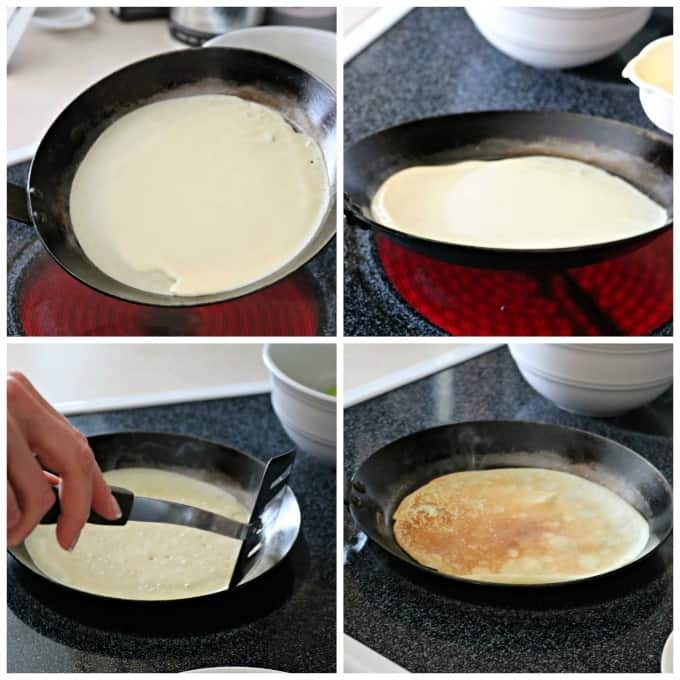 Heat a crepe pan or 8-inch skillet over medium heat and lightly brush with the melted butter. Using a scant 1/4 cup of batter, pour into the pan. Use a tilt and swirl method to evenly coat the bottom of the pan. Cook for about 1 minute before circling the pan with a rounded-edge spatula to loosen the browning edges. It will be ready to flip soon after that. Gently guide the spatula under the crepe and flip. Cook for an additional 30 seconds - 1 minute until completely cooked through and slightly golden. Preheat oven to 350° F and prepare a 9 X 13-inch baking dish by spraying it with cooking spray. Place the cottage cheese, spinach, egg, 1 cup of the mozzarella cheese, Parmesan cheese, parsley, garlic, Italian seasoning, and salt and pepper to taste, into the blender and mix until just well combined. It may be necessary to remove the container from the base and stir before mixing again. Place one crepe onto a plate and put 3 tablespoons of filling in the center. Fold the bottom of the crepe up to cover the filling and then fold the top down. Place into the prepared baking dish, seam side down and gently pat to move cheese, so that fills the entire crepe. Continue with remaining crepes and filling. 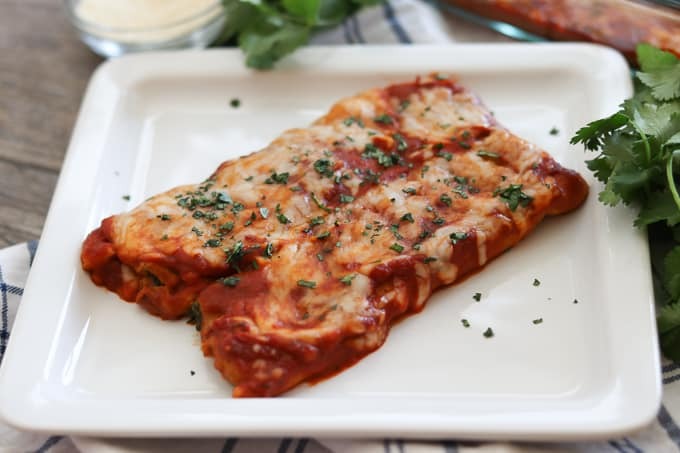 Pour sauce over manicotti and spread so that it is completely covered. Cover dish with foil and bake for 25 minutes. Uncover and sprinkle remaining mozzarella cheese. Return to oven uncovered and bake for an additional 5 - 7 minutes until cheese is completely melted. Thanks for reading and remember to vote for your favorite recipe at Shamrock Farms! This is great ! Thank you !